Plant resistance to this disease has considerably reduced its economic importance; nevertheless it is of high phytosanitary importance. The most serious disease of sweetcorn, causing yield reduction and susceptibility to stem rot; less destructive in other types of maize. Outbreaks are generally sporadic. The disease caused major losses in North America in the 1930s, but subsequently has caused only minor outbreaks, except for a few extensive epidemics on susceptible sweetcorn hybrids. The current relatively low economic importance of the disease in North America is due primarily to adequate levels of resistance incorporated into maize hybrids grown where the disease occurs. In sweetcorn, no or minimal losses occur in resistant hybrids, but losses can be significant in susceptible hybrids grown where flea beetles occur. 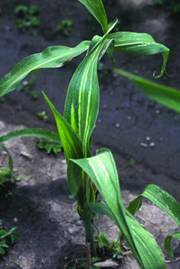 Losses frequently range from 40 to 100% when susceptible sweetcorn hybrids grown under epidemic conditions are infected before the 5-leaf stage. Severe losses due to Stewart’s wilt were reported in Italy in the 1940s and 1980s, but the disease has not persisted in Europe due to absence of vectors. First phase (wilt phase): sweetcorn particularly susceptible, not usually seen in other types of maize. Water-soaked lesions, turning long and pale green to yellow, with wavy margins, and running the length of the leaf. These streaks dry out and turn brown. Infection may move into the stem and spread through the vascular system, causing general stunting and wilting. Plants infected at seedling stage may be killed; if infected later they may reach a reasonable size. Severely infected plants may produce premature, bleached tassels that die before the rest of the plant, or those that set seed develop small nubbins with few kernels. Small water-soaked spots, which later dry and darken, may develop on the husk of the cobs; bacteria may exude in fine droplets on the inner face of the husk. Cavities may form in the stalk near the soil in severely infected plants. Second phase (leaf blight): usually most apparent after flowering. 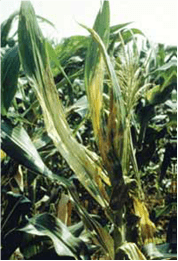 Seen in non-sweetcorn maize which is usually resistant to wilt phase. Irregular, pale green to yellow streaks of variable length appear on leaves, originating from feeding marks of corn flea beetle (Chaetocnema pulicaria). May cause severe leaf necrosis, with whole leaves turning straw-colored. Major hosts: maize (particularly sweetcorn), teosinte. Minor hosts: other Poaceae species including fodder plants, e.g. eastern gamagrass (Tripsacum dactyloides), and weeds. Western USA and Canada, Mexico, Costa Rica, Puerto Rico, Bolivia, Brazil, Guyana, Peru, Austria. Various historical records in Europe and Asia where P. stewartii is now absent. Indigenous to America; introduced elsewhere with seed. The pathogen is primarily transmitted by the corn flea beetle, Chaetocnema pulicaria. Feeding wounds act as points of entry. Vectors overwinter the pathogen and cause secondary local spread. P. stewartii can also be seed-transmitted, and infected seed is likely to be the cause of international spread. Detection with ELISA using AGDIA protocol (http://www.agdia.com). Chemical treatment can be applied to control the vector C. pulicaria. CAB International. 2007. Datasheet: Pantoea stewartii. In Crop Protection Compendium, 2007 Edition. Published as CD-ROM and website. Wallingford, UK: CAB International. McGee DC. 1988. Maize Diseases: A Reference Source for Seed Technologists. St. Paul, MN: APS Press. pp. 36-38. The pathogen is confined to the USA, where the adoption of resistant hybrids has considerably reduced its economic importance. Nevertheless it is of high phytosanitary importance. Discovered in Nebraska in 1969 and has gradually spread across the US corn belt. Aggregate losses are minor but may be severe in individual fields. General stunting and wilting. On leaves, gray-green streaks along veins, with water-soaked spots that resemble freckles. Bacterial exudate may appear on diseased tissue. In stalk, rotting with discoloration of vascular bundles. Plants may be infected at any growth stage. Major hosts: maize, teosinte, sugarcane (accharum officinarum), sorghum (Sorghum bicolor), Sudan grass (Sorghum sudanense). Minor hosts: triticale, barnyard grass (Echinochloa crus-galli), wheat. Most important inoculum source is crop residues, where the pathogen can overwinter. Injuries from wind or sand facilitate infection. It is also seed-transmitted (at low rates of transmission). Minor: disease occurs sporadically in India, but does not cause substantial crop damage. May be a concern where susceptible germplasm is grown in hot and humid areas. May affect plants from seedling to post-flowering stages. 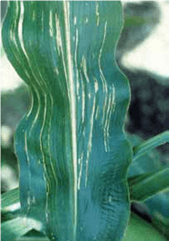 Narrow, white/straw-colored/pale green lesions on leaves, initially oil-soaked and translucent. Under optimum weather conditions, lesions expand along veins producing a conspicuous striping, mainly in the youngest leaves. Stripes later become papery thin, dry, and brown, often with shredding of the infected tissue. Severe damage of the top leaves results in tassel rotting, when dead leaves enclose the tassel. Major hosts: maize, rice (Oryza sativa), sugarcane (Saccharum officinarum), sorghum (Sorghum bicolor). Minor hosts: oats (Avena sativa), tea (Camellia sinensis), finger millet (Eleusine coracana), barley (Hordeum vulgare), millet (Panicum miliaceum), pearl millet (Pennisetum glaucum), foxtail millet (Setaria italica), yellow foxtail (Setaria lutescens), green foxtail (Setaria viridis), wheat. Wild hosts: wheatgrass (Agropyron spp. ), prairiegrass (Bromus catharticus), awnless brome (Bromus inermis), maintain brome(grass) (Bromus marginatus), fishtail palms (Caryota spp. ), large crabgrass (Digitaria sanguinalis), barnyard grass (Echinochloa crus-galli), paspalums (Paspalum spp. ), other grasses (Poaceae), teosinte. Worldwide, though with generally limited distribution. The seed lot is destroyed. CAB International. 2007. Datasheet: Acidovorax avenae subsp. avenae . In Crop Protection Compendium, 2007 Edition. Published as CD-ROM and website. Wallingford, UK: CAB International. McGee DC. 1988. Maize Diseases: A Reference Source for Seed Technologists. St. Paul, MN: APS Press. pp. 33-34. The CIMMYT Maize Program. 2004. 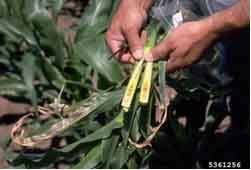 Maize Diseases: A Guide for Field Identification. 4th Edition. Mexico, D.F. : CIMMYT. pp. 88-89.